"You're not leaving, are ya, Stan?" Sony Pictures Classics has debuted a new official US trailer for Stan & Ollie, a heartfelt new film about two movie legends - Laurel and Hardy. This comedy stars Steve Coogan as Stan Laurel and John C. Reilly as Oliver Hardy as they tour around the UK in what would become the pair's triumphant farewell tour. They struggle to maintain their friendship after so many years, but find joy again in performing for audiences, solidifying their timeless legacy. The film's cast also includes Shirley Henderson, Nina Arianda, Stephanie Hyam, Rufus Jones, Susy Kane, Joseph Balderrama, and Danny Huston. "A portrait of the most tender and poignant of creative marriages… trying to rediscover just how much they mean to each other." This received some great reviews out of the London Film Festival, and arrives in US theaters on the very last Friday of the year. I'm quite excited to see it soon. Have a look. You can still watch the original UK trailer for Baird's Stan & Ollie here, to view the first look again. The true story of Hollywood's greatest comedy double act, Laurel and Hardy, is brought to the big screen for the first time. 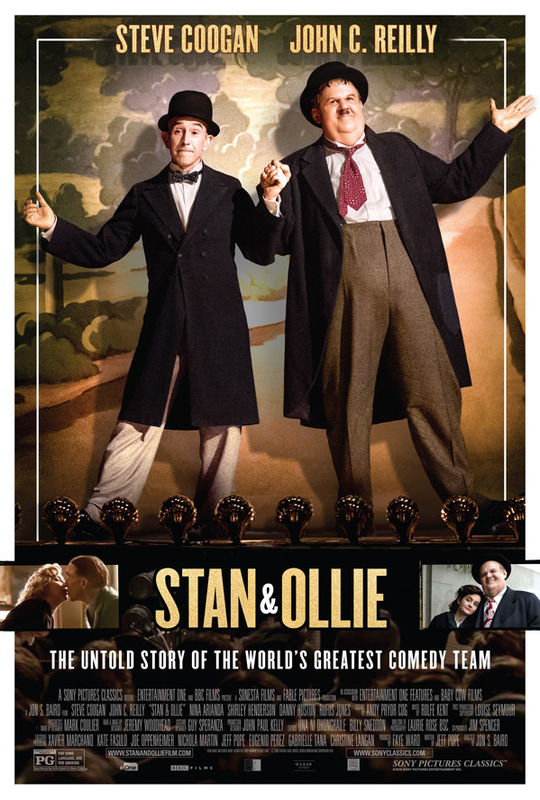 Starring Steve Coogan and John C. Reilly as the legendary movie icons, Stan & Ollie is the heart-warming story of what would become the pair's triumphant farewell tour. With their golden era long behind them, the pair embark on a variety hall tour of Britain and Ireland. Despite the pressures of a hectic schedule, and with the support of their wives Lucille (Shirley Henderson) and Ida (Nina Arianda) – a formidable double act in their own right - the pair's love of performing, as well as for each other, endures as they secure their place in the hearts of their adoring public. Stan & Ollie is directed by Scottish filmmaker Jon S. Baird, director of the films Cass and Filth previously. The screenplay is written by Jeff Pope. This first premiered at the London Film Festival this fall. Sony Classics will release Baird's Stan & Ollie in select US theaters starting on December 28th at the very end of the year. Interested in watching?